Begin with a flashback to pre-coma Charlie. He and his dad Nick are doing origami while their mother watches happily. They all go to a party and Nick leaves early to bring Charlie home. It's raining and Charlie gets sick in the car on the way home. Nick turns around to undo Charlie's seat belt so he can lie down and then they get into an accident. When Charlie arrives at the hospital, he's still awake and Nurse Jackson tends to him as he goes in for surgery. Charlie ends up in a coma and his mother blames his father for it. So now she is the one with visitation rights while he sneaks in as the volunteer guitarist. Return to present day and Charlie's mother Mandy has come to speak with the "Men in Black" who have come to assess whether the hospital is a beneficial setting for Charlie or just a waste of money. Dr. McAndrew is forced to admit that Charlie's prognosis isn't looking good. Nurse Jackson is intent on keeping a promise to Charlie that she would be there when he woke up from surgery. Mandy finds one of those origami in Charlie's room and is angry at the fact that Nurse Jackson has been letting Nick sneak in to see him. But she becomes more concerned with the belief that Charlie may never wake up. She meets Nick, who has come to see what is happening, and he tells her that she will never hate him as much as he hates himself. Kara tries and fails to get high off dry-erase markers, after which she bonds with Dash. She learns more about his condition (he needs a new lung). Kara wants tips on how to improve her standing on the the transplant list but he'll only help if she gets him into a particular fancy apartment building. Kara agrees, not only to get the help she wants but so she'll have something mischievous to do to pass the time. Kara gets herself and Dash in using her mothers' real estate connections and they're able to sneak up to the roof while Dash carries around a bag. Upon getting up there, Dash spray-paints an impressive mural. Kara admires the mural before returning to the hospital with Dash. He admits that he has resigned to his failing health, since he wouldn't be in pristine health even if he received the transplant. But he wants to be remembered, hence the mural. Ruben announces he's leaving the hospital but before he leaves, he lets Jordi drive his fancy car as a congratulatory gift for becoming an adult (remember Jordi was emancipated last week by his mother). Emma comes along to teach Jordi to drive and Leo sits in the backseat. The two bicker with all their unresolved feelings, despite their claims that things are finished between them. When they return to the hospital, Leo and Emma argue once again. Leo apologises for what he said about her not needing to be there and when he realises that Emma is jealous of Kara, Leo tells her that's ridiculous and plants one on her. Jordi spies the re-connection from afar. Mandy isn't planning on appealing the decision of the Men in Black to move Charlie to another facility. Leo tells Nurse Jackson that he saw and spoke to Charlie while under anaesthesia and mentions the origami, which is enough proof for Nurse Jackson to believe him. 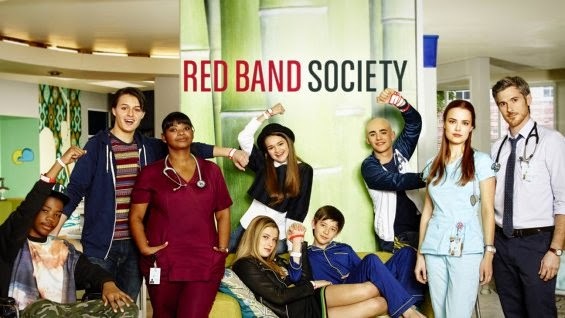 The Red Band Society heads up to the roof for a toast and upon getting there, Dash's mural is in perfect view. They all admire it and Dash smiles proudly, though neither he nor Kara says that Dash was the one who painted it. Jordi takes Emma's hand, and Leo seethes in jealousy. Nurse Jackson is switching the label on another patient's blood with Charlie's name on it. We can only assume that she's putting together a way to keep Charlie right where he is.